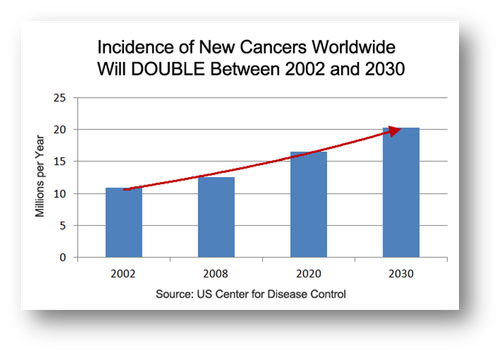 Cancer cases are increasing, with more than 20 million new cases predicted in 2025, compared to 12 million in 2008. Early detection is very important because it can improve outcomes. Typically, more treatment options are available when diagnosed early and resulting survival improves. In the USA, the five year survival rate improves by at least four times when cancer is diagnosed early and before it has spread. Unfortunately, to date the majority of cancer patients are diagnosed at later stages. “For nearly all cancers, early detection means cure by standard treatments of surgery and radiation.” Dr. Leland H. Hartwell, March 2006 President, Fred Hutchinson Cancer Research Center, winner of the Nobel Prize in Medicine and Physiology, 2001. The mission of Savicell™ is to help save life with a patient-friendly platform that is well-suited for early diagnosis.